Who says Hollywood doesn’t make socially redeeming movies anymore? 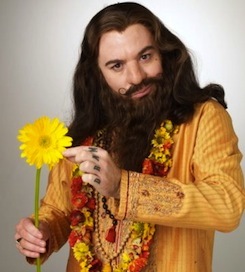 Just take a look atLove Guru, the Mike Myers film. It’s loaded with romantic advice. In fact, we’ll list 10 love lessons you can learn from the movie Love Guru. Acts of kindness should never be motivated by expectations of reciprocal gestures. For instance, it’s OK if your Uncle Jack helps you off an elephant, but you really shouldn’t return the favor. Just saying. Until a man learns to love himself, he may only date three girls named Ann: Ann Visible, Ann Flatable, and Ann Job. Wisdom of Guru Pitka, Part 2 enlightens us as to the true definition of intimacy : “I speak of Intimacy, or ‘Into me, I see’.” The guru is telling us that we need to know ourselves before we can become intimate with another. Or at least that’s what we think he’s trying to say. If you love someone, you will make for them a Quebec pizza. It may not seem like much on the surface, but there’s love in there. And some ketchup. If your boyfriend looks as though he’s smuggling a schnauzer, don’t be alarmed. That’s a good thing; though you may want to keep him on a short leash, away from your girlfriends. Wisdom of Pitka, Part 3: Love means having a lot of Clarity, Organization, Charm, and Knowledge. In fact, the more you have, the more love you are likely to get. Wisdom, Part 4: When your partner is being disrespectful of your feelings, it is important that you tell them, “Be Loving and Openhearted With My Emotions”. If you have any hopes of having a second date with her, don’t take her to see this film on your first date.